First and third. – Dirty wet dog , boats and sailing. The third post in a series about buying your first boat so today lets take the logical approach to thinking about a first boat for a new sailor. When i bought my previous boat, the Frances 26, it was because i had always liked the look of them and they had a good reputation as a steady and comfortable cruising boat that could do the miles. Added to that i had sailed a boat with the same hull but aside from that there was little other logic involved. I knew that i wanted a long distance cruising boat that would carry 2 people, their gear, water and stores for extended voyages and the Frances would have been good for that but even today i recognise that i could have got a better boat for the same budget and one that would have cost a lot less to refit……so who am i to preach the logical approach eh ? In today’s post i am going to make a series of points about the thinking mans way of selecting a first boat mainly on the qualification that i definitely didn’t do that myself. The first and most obvious point is that of cost and budget, that’s so obvious and important that i am going to cover it in a separate post but for now want to share a basic rule of boats : that the boat that will get you on the water is the one that you can afford to buy (and run) and not necasarily the one that you want. A very good example is that of Dylan Winter and the ‘Slug’ which i believe is a Mirror-Offshore design which is a small and not great sailing boat but one which Dylan could afford to start his round Uk voyage in and by the look of it had a lot of fun with along the way until he could buy a much better boat. Putting the cost and budget issue aside for a later post i would say that a good starting point, although not the only starting point, is to have a good long think about what you want to use the boat for, where you are going to keep it and even from just those 2 things work out what features you want in a boat. It might even be worth doing this as a formal exercise and even write it out to help fix the basic requirements in place, perhaps as a things that are essential, things that are desirable and things that aren’t necasary. To illustrate this point i would like to talk about my current cruising boat as an example and explain how i chose that design. Aside from the fact that i had to work within a specific budget and again, i will come back to that, i drew up a set of essential features . 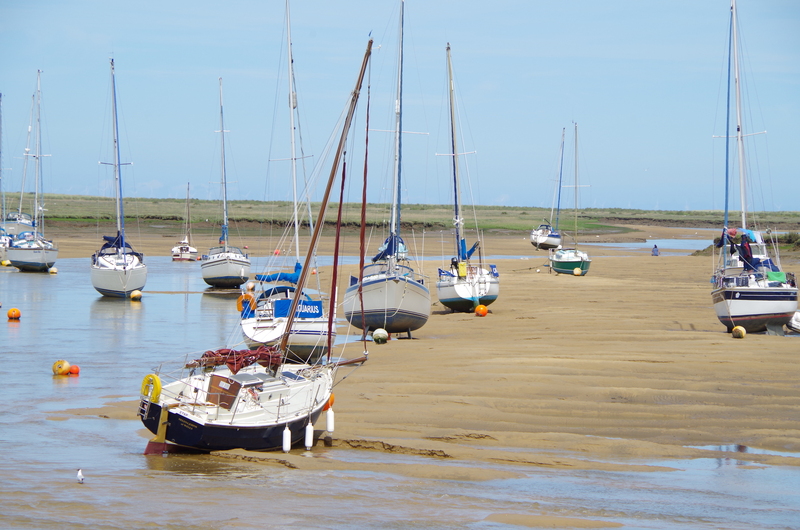 First was that the boat would have to live in a tidal mud berth where it would dry out and secondarily that it would be desirable to have the boat sit level when dried out. That would mean i would be able to use my local boatyard which has drying tidal alongside berths and some shallow water moorings. On my voyages it would also mean that i could beach the boat, go for a walk, land easily and scrub the bottom. With that basic specification it would also be likely that the boat would have either shallow draught or variable draught. That immediately excluded a whole load of boats that i liked and just about every boat that i had previously sailed except for my little Wharram catamaran. Second point : that the boat had to be a ‘good’ sailing boat rather than a total dog !. In the range of small and shallow draught sailing boats that i would likely be able to afford that was always going to be a compromise because a bilge-keeler or light centreboard boat isn’t going to punch its way through a channel chop like a heavily fin-keeled racing boat. So i would have to accept some performance compromise but i didn’t see any reason why the boat shouldn’t be a good sailing boat in some conditions. As it happens the Liberty has extraordinarily good ghosting ability and is a very capable and quick downwind boat that just suffers a bit in an upwind chop and i have even been able to improve that with ballast and re-balancing. I could talk about sailing performance in small boats at great length but as with my next point i have another post almost written which is just about sailing qualities. Comfort. The most comfortable boat i have ever sailed and lived aboard was my Frances 26, solo it felt incredibly spacious for a 26′ foot double-ender, 2-up it worked fine as both me and my partner could have our own dedicated bunk and there was a good space to relax together. It had a great little galley and a huge chart table which doubled up as our kitchen table. More importantly it was a dry and warm boat inside, had a steady motion and a good watch-keeping position. I knew that it would be impossible to get that degree of comfort in something 3 or 4 feet shorter and much less beamy. However, as with the Frances i knew that i wanted a boat with a cabin that was dry and that bunks that would stay dry and that 2 people could sleep in comfortably. Comfort was mentioned in the reader comment that sparked this series of posts so maybe it is a priority for that potential newbie boater. I have a post almost complete about the subject of comfort in small boats so i will leave this section for that post. So far we just have the basic essential features was looking for in my current cruising boat ie that it had to be within budget, had to dry-out level in a mud berth, had to sail in shallow water but equally had to sail tolerably well and keep a sea in difficult conditions. It had to have a cabin that i could sit in and lie down comfortably enough to sleep, be dry and that i must be able to prepare a basic meal in a fixed galley while sailing. I didn’t specify material of construction or hull form as i knew of some nice wooden boats that might fit the bill but i then went onto my next major point which is how much the boat can be left alone and how much care and attention it needed to keep it in good order. Going back quite a few years i had the good fortune to meet and speak with Nigel Irens about his design ‘Roxanne’ and had a look around that boat. Its still one boat i desire the most and recently saw the same boat sailing in St Peter Port. I wanted to build a Roxanne myself and we were discussing buying a molded hull and all the difficult bits such as the drop keel. I realised at that point that i couldn’t afford the budget and Nigel kindly suggested that many wooden boats were at that time better value….more boat for buck… and that there were boats to take a look at. Well i have had 2 definitely bad wooden boats : one East German Folkboat and one Deben 4 Tonner. The Deben was a truly horrible little boat and i couldn’t get rid of it fast enough but i did consider a better starting point for a small boat project. Years later i almost bid on a plywood boat that would definitely have been a project/rebuild but that i then found a boat at the same size with very similar characteristics but in GRP and that would have needed much less initial work and ultimately needed much less attention. Just for the record the ply boat was a Waarschip quarter-tonner and the Grp boat a Sadler 25. While seemingly not fitting my spec the Waarschip was to be rebuilt with a Scheel-keel. Now the actual choice there was to find a boat with slightly better sailing qualities, especially upwind, than my Liberty, and to get slightly more space and comfort for longer cruises. The actual point here though is that i i would have chosen the Sadler because in GRP it could be left longer unattended in a berth without worrying about its condition as much. A good epoxy and glass coated ply hull is a good long term solution but a classic wooden carvel or clinker hull does need regular attention….in fact more attention than i can give a boat. So where that takes us in this post is to chose a boat that you can maintain and that means partially which you have the skills to maintain yourself and crucially the time that the work and attention requires. Has a cabin and ‘enough’ comfort. Grp rather than classic wood. Of course they are merely my requirements and my essential/desirable characteristics : i actually went into the whole thing in a whole load more detail but then this wasn’t my first boat and i had already amassed a whole load of information about lots of different boats within my budget and that might do the job. I could and will summarise this idea really quickly : that the best boat to start (and continue with) is the one that you can afford first and foremost and then is the one that does the things that you want it to. Time to go kick some tyres ! Next First boat, dirty talk. Thanks for this series Steve — very useful. Not my idea of comfort! That looks a bit tight. Do you know what type of boat Gannet is. The comfort post is one i am writing this weekend in between sessions with the paint brush and dying hoover. Good luck with the painting and here’s hoping the hoover lasts. Looking forward to the comfort post. Thanks Stephen. I am writing the boats/comfort post right now which will come out next week and then do the next one which will be small performance budget boats……an oxymoron if ever there was one. Take a look at 2 lifting keel yachts, the Hunter Delta 25 and Super Seal 26. I’ve certainly covered one of those in a more recent series in which i came back to the same idea but with larger and more expensive boats. If you are interested it will be in the ‘Thin Water’ series….think’s it was called something like ‘The thin racy ones’ Dehler 25 and Evo 25 are in there as well. Nice to get comments back btw.